Rapid and prolonged upset of the gut flora can be caused by antibiotics, opportunistic pathogens and environmental and psychological stress. This imbalance can cause bacterial hypersensitivity, facilitating such diseases as colitis, IBS and asthma among others. A healthy microflora can be encouraged by mucins, ricinoleic acid and gum Arabic. All ingredients are resistant to human digestive enzymes. 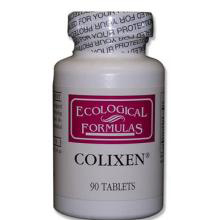 Colixen is a scientifically-designed nutritional supplement. Manufacturing processes provide a steady-release delivery system throughout the intestinal tract. Dosage Guidelines:Take one tablet three times daily.